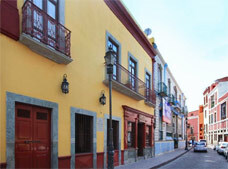 This suite is an excellent option for your next trip to Guanajuato. These relaxing accommodations have a flat-screen television, a ceiling fan, cable TV and a full bathroom. These simple rooms are decorated in a charming style, featuring tiled floors and beamed ceiling, as well as an incredible array of convenient amenities, such as a flat-screen television with cable, Wi-Fi and more. These comfortable accommodations provide the privacy and convenience you need to enjoy a restful stay. Each room comes with wireless Internet access, a flat-screen TV and a full bathroom.